Matthew has rapidly intensified into a Category 5 hurricane, the strongest in the Atlantic since Hurricane Felix in 2007, as it makes its way over the warm Caribbean Sea. At 11:00 PM ET, data from an Air Force Hurricane Hunter plane indicate that the maximum sustained winds have increased to near 160 mph (260km/h) with higher gusts, according to the U.S. National Hurricane Center, Miami, FL. 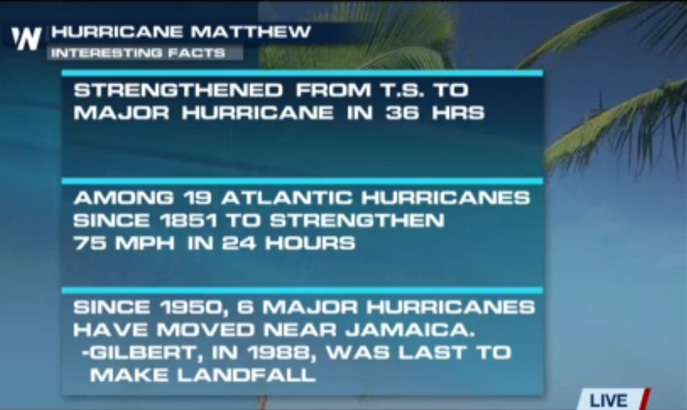 Matthew is a category 5 hurricane on the Saffir-Simpson Hurricane Wind Scale. Some fluctuations in intensity are possible this weekend, but Matthew is expected to remain a powerful hurricane through Sunday. The hurricane is about 80 miles (125 kilometres) northwest of Punta Gallinas, Colombia, and about 440 miles (710 kilometers) southeast of Kingston, Jamaica. 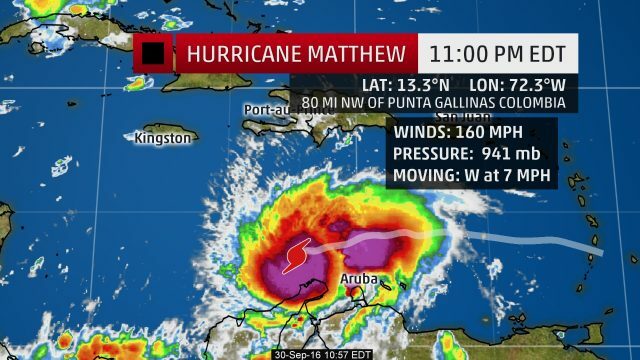 Matthew poses a danger to Jamaica, parts of Hispañola, eastern Cuba, and the Bahamas early next week. Its potential U.S. impact later next week still remains unclear. Matthew became a Category 1 hurricane on Thursday afternoon, the lowest on a 1-5 scale, then swiftly rose to Category 5 in just over 36 hours. It intensified from a Category 2 to 5 in just 12 hours. The eye of Hurricane Matthew was located near latitude 13.3 North, longitude 72.3 West. Matthew is moving just south of due west near 7 mph (11 km/h). A turn toward the west-northwest is forecast on Saturday, followed by a turn toward the northwest on Sunday. On the forecast track, the center of Matthew will move north of the Guajira Peninsula tonight, move across the central Caribbean Sea on Saturday, and be approaching Jamaica late Sunday. Hurricane-force winds extend outward up to 45 miles (75 km) from the center and tropical-storm-force winds extend outward up to 205 miles (335 km). Since 1950, 6 major hurricanes have moved near Jamaica. Gilbert, in 1988, was the last to make landfall on September 12, with winds reaching 175 miles per hour, the Category 5 hurricane devastated Jamaica.